Welcome to the 3rd and final part of my Twitter guide for the absolute beginner. In part 1 of the series I wrote about the fundamentals of Twitter and in part 2 I covered some more advanced topics like the importance of following, ideas for what to tweet and how to setup twitter searches so you can monitor your brand. In this section I'll explain how to tailor the look of your business's Twitter profile to match your company's brand and share some fun tools that'll make managing your Twitter presence a breeze. Let's get started! Your brand is a huge part of your small business's public persona, so you should do your best to work it into any social network you plan to participate on. One great feature that Twitter provides is the ability to customize your profile background as well as the color of various text elements on your Twitter homepage. Although a lot of folks use Twitter from their mobile device, and the new Twitter redesign has a sidebar that does take up a bit more space than the previous version, but any chance to share your brand should be taken advantage of. Plus, it lends credibility to your online pursuits if you take the extra step and make a nice-looking Twitter page. The 41 to 108 pixels on the left side of your profile background should be considered the visible content section. When you're using your favorite image editor to create your branded twitter background, put your logo and company web address in that section. It's also a good idea to place your Facebook vanity URL in that section as well. 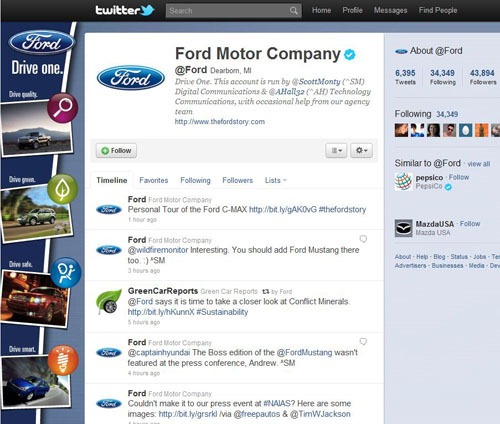 Below is Ford's official Twitter page, with an excellent example of a well-done Twitter background. Notice how the designer who put the background together placed all of the relevant branding information within the left-most 100px of the image, thus ensuring that most screen resolutions will be able to view the information. Now that you have your background image it's pretty easy to update your profile. Just login to Twitter and click the Design tab in your Settings section. At the bottom of the page you'll see two links like the ones shown below. The left button will let you upload your new background image, and the right button will let you choose colors for various text and page elements in order to tailor your profile's color scheme to your logo and brand's color palette. I recommend using your own discretion when changing the color and style of text in particular. Above all else be sure to review the changes and make sure everything is readable. There's no quicker way to get a visitor to navigate away from your page before having the chance to follow you then by creating a profile that's hard to read (white text on a yellow background is a no-no, for example). We're coming to the end of my little guide and at this point you're a Twitter pro! The good news is that there are a lot of services that make all of this much easier. Below are some of my favorite Twitter applications for updating on the go, from your desktop and from the web browser. Tweetdeck was one of the first desktop applications to really take off, and it has only blossomed since then. as expected Tweetdeck lets you monitor the incoming tweets from the folks you follow and pt new tweets, but there is some advanced functionality included as well. My favorite part about Tweetdeck is that you can setup your Facebook, Foursquare and Google Buzz accounts along with Twitter so it becomes your one-stop shop for social media management. It's also a great way to monitor Twitter searches, as you can dedicate a column of Tweetdeck's display to your search. The mobile version of Tweetdeck is also my favorite way to keep up with Twitter from my phone. Hootsuite is sort of the web-based alternative to Tweetdeck, because rather than having a dedicated desktop program it runs inside of your web browser (there are mobile phone versions as well). Hootsuite also lets you post to other social media services like Facebook, it has a built-in URL shortener for sharing links and coolest of all it'll let you schedule tweets and status updates in advance so you can get all of the work done in one sitting. Finally, and this is kind of an obvious one, the official Twitter app is excellent. Twitter actually acquired the company that previously made Tweetie, a Twitter client for the Mac and iPhone, to do a special take on the redesigned Twitter interface. In my opinion their investment was well worth it. If you have a smart phone or iPad and are looking for a Twitter-only client, simply search "Twitter" in your app store of choice. On the mac you can get the official Twitter desktop application from the mac app store. The official Twitter app replicates the look and feel of Twitter.com better than any other so far, and with built-in URL and image shortening services you'll be off and running in no time. 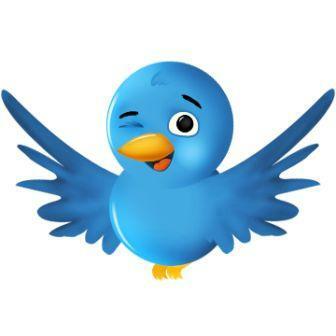 You've made to the end of my 3 part guide to Twitter for beginners! If you still have questions feel free to contact us or send an at reply to @protocol80 on Twitter!